Unitarian Universalists believe that each child is special, holy, sacred, and holds within the potential to change the world. Child dedications and naming ceremonies are crafted in close collaboration with the parents and family of the child. The minister or officiant will work to write a ceremony which fits each family’s unique beliefs and desires. The idea of a child dedication may naturally lead one to ask, “Dedication to what?” Traditionally this ceremony was an event in which the parents would make a commitment to rear the child in a certain faith tradition. We Unitarian Universalists turn the idea of the child dedication on its head. We believe that everyone, including children, finds their own paths in life. Therefore, the child dedication ceremony will include a pledge of commitment from the parents, extended family and community to the child. This pledge of commitment might include teaching the child, providing materially and emotionally for the child, and just being a community which provides a welcoming place for the child. The child’s name will have special significance in the ceremony. It is through the name of the child that the community comes to know him/her. It is the name of the child which links the child to its parents, grandparents, and ancestors. It is through the name of the child that he or she develops its own unique personality, place in the world. We welcome the opportunity not to dedicate your child to Unitarian Universalism but to dedicate Unitarian Universalism to your child. Let's look at the Christian holiday of Easter and delve deeper into its similarities with Pagan rites which predate it. Maybe we can find, along the way, some inspiration for us modern Unitarian Universalists. Adding the warm light of her ministry, Debra Guthrie, AUUC’s new part-time minister is working hard to bring us great worship services, while increasing our presence in the community and helping us GROW! 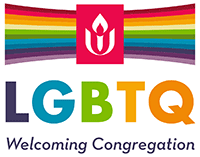 The AUUC publishes a weekly electronic newsletter, A Look Ahead, to announce upcoming AUUC events and events in the wider community of general interest to Unitarian Universalists. We also publish a monthly e-newsletter, Chalice Connections. Anyone may subscribe.